Clathrus ruber is a remarkable species, almost certainly introduced rather than native to northern Europe. 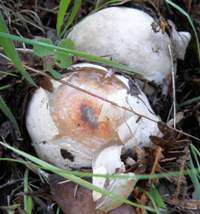 When seen for the first time it is often assumed to be something other than a fungus. Like the common stinkhorn and the dog stinkhorn, this 'cage stinkhorn' emerges from a white ball or 'egg' - and like other members of this family the egg is said to be edible. I have never met anyone who can confirm that from first-hand experience, and there are other reports saying that eating Red Cage eggs can cause serious gastric upsets. The picture above shows both a mature and a newly-emerged fruitbody, the latter exhumed to show the rhizomorphs at the base of the 'egg'. Rare in mainland Britain but fairly common in the Channel Islands, this saprobic fungus is generally referred to as the Red Cage or as the Lattice (or Latticework) Fungus. Clathrus ruber is common in central and southern Europe. (We see them on roadside verges and in Cork Oak forests in the Algarve region of Portugal.) Clathrus ruber is also recorded from Asia and North America. 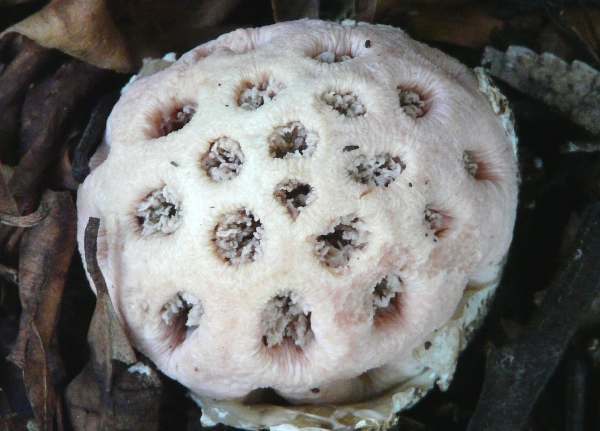 First described scientifically by Pier Antonio Micheli (1679-1737), the Italian botanist who first discovered fungal spores, Clathrus ruber, was was given its current scientific name in 1801 by Christiaan Hendrick Persoon. Synonyms of Clathrus ruber include Clathrus cancellatus L., (Clathrus cancellatus Tourn. ex Fr. ), Clathrus flavescens Pers., Clathrus nicaeensis Barla, and Clathrus ruber var. flavescens (Pers.) Quadr. & Lunghini. 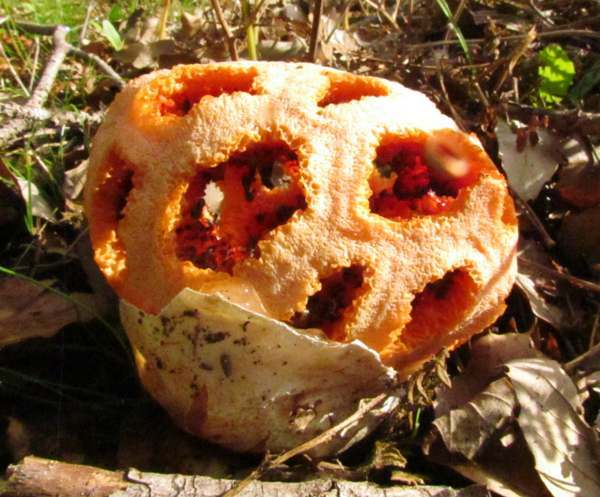 Clathrus genus, the Red Cage Fungus, is the type species of the Clathrus genus. 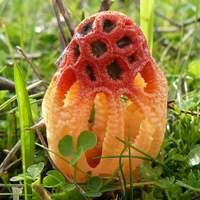 The generic name Clathrus means 'a cage', while ruber means red, a rerefence to the colour of most of the fungi in this genus of stinkhorn-like fungi. In France this strange stinkhorn is known as Coeur de Sorcière, which means Sorceror's Heart. The red colour, which is due to the presence of carotenes (the chemicals that give carrots their characteristic deep orange-red colour) seems only to reinforce the smell of this stinkiest of mushrooms: that of rotting meat. The red colour might even, in being similar to the colour of meat, be a further attraction to flies. 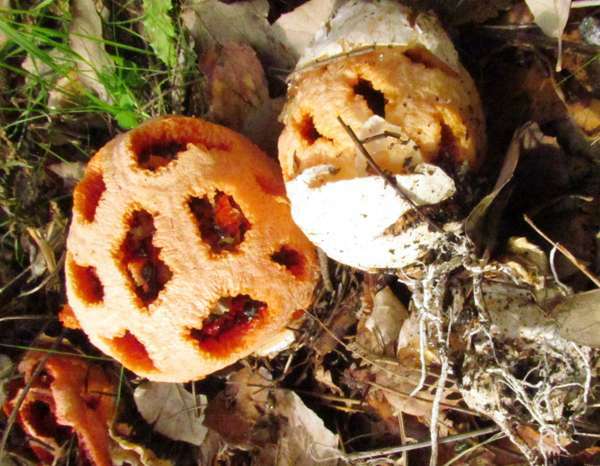 Initially appearing as a half-buried whitish ball or 'egg', the cage-like formof this fungus becomes visible once the outer membrane of the egg bursts - pictured on the left. 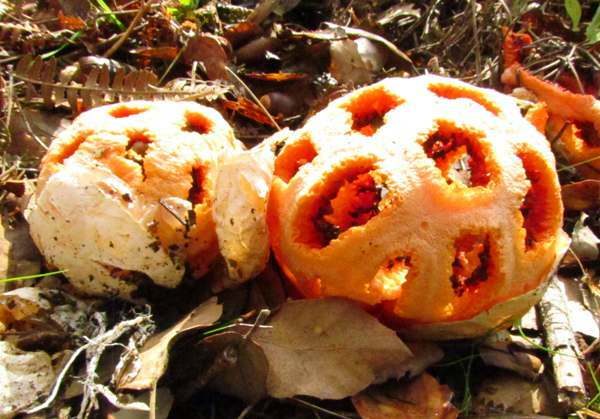 Within a few minutes, the fruitbody of the Red Cage Fungus expands to become a large, globe-shaped or ovoid structure whose surface consists of a lattice in the form of a rounded or oval cage-like mesh. The bright red colour makes this striking species very easy to identify; however, it is a relatively rare find in Britain and occurs mainly in the south of England and on the Isle of Wight and in the Channel Isles. 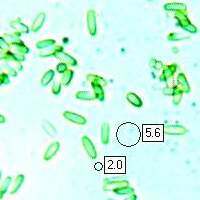 Fruitbodies erupt and then collapse in little more than 24 hours, and within two or three days all signs of the fruitbody have disappeared. Typically 5 to 15cm across and most often roughly spherical, but some forms (or are they a different species?) have very narrow almost wire-like lattice frameworks while other related species are vertically aligned ellipsoids. This fungus has no stem. The inside of the cage is coated with a dark green smelly gleba that attracts flies, and as the gleba sticks to the legs of the flies it gets carried to other locations where a new Red Cage colony could result. 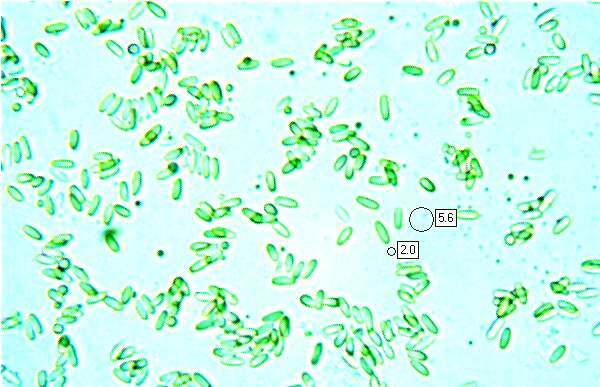 Elongated ellipsoidal, smooth, 4–6 x 1.5–2.5µm. Strong, unpleasant odour reminescent of rotting meat; no distinctive taste (or so it is said!). Saprobic, mainly found in parks and gardens, Clathrus ruber often fruits in small groups on or beside decomposing vegetable matter and in particular compost heaps. Increasingly this species is being found growing on bark mulch in parks and gardens. June to September in southern Britain, but all year round in the south of France and from October to May in the most southerly parts of Europe. Unlikely to mistaken for any other species in Britain and Ireland, although elsewhere in the world there are several similar species in the Clathrus genus. There are at least 20 known species in the Clathrus genus (and surely more waiting to be found), and most of them occur in tropical forests. Recently a new Clathus species has been discovered in South Africa and given the name Clathrus transvallensis. To date we have not seen any pictures of this species. This is the scientific name of an australasian import that is a very rare sight in Britain; however, that particular species usually has an open, wire-like cage structure. The cage fungus shown below has a very robust mesh and might possibly be a different species. The Red Cage fungi shown on this page were photographed either in France or, as the one shown below, in southern Portugal, where these members of the stinkhorn group are very common. This page includes pictures kindly contributed by Annemarie Fortune.